When schedules allow, Susannah and Patti Casey love to perform together. Two of Vermont’s most talented and best known singer-songwriters enjoy playing venues where they can display their voices, songwriting ability and good humor. Small locations like libraries, churches and community centers within a few hours drive of Central Vermont are ideal for their blend of Americana and New England-tinged, original, acoustic music. Low key in preparation (all acoustic, except for larger venues), high energy musically, intimate and most important, the ability to bring music to people in small communities who can’t get to some of the larger shows make their visit to your community a memorable event. If you are interested in having these two dynamic performers in your community, send an email to bookings. Patti and Susannah will check their calendars and get back to you right away. They are also available to play at weddings, parties and other special occasions. 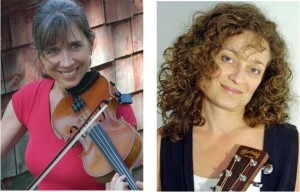 "Over 100 people showed up at the Athenaeum to enjoy the stunning performance by Susannah Blachly and Patti Casey. Their tunes and lyrics, many original, still linger in my head and resonate in my heart. I know all who attended felt moved by these gifted musicians."